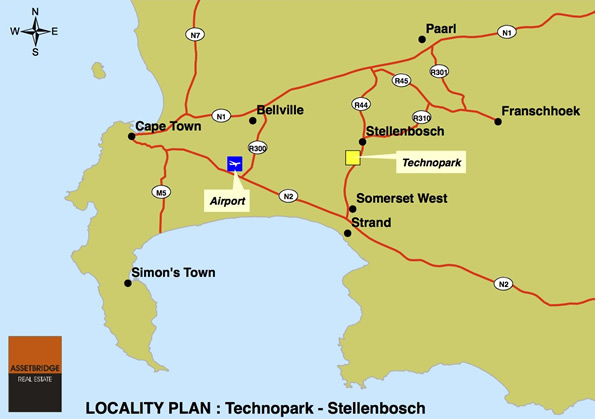 Technopark is situated in the rural area immediately adjacent to the town of Stellenbosch and is bordered by vineyards and the Stellenbosch Golf Course. It is situated on the crest of a hill, which affords the park magnificent views of surrounding vinyards. It is accessible from the R44 regional route linking it directly to Stellenbosch, Somerset West, and the N2 to Cape Town. Technopark is therefore well connected to the main transportation routes of the district / metropolitan Cape Town, and thus to tertiary education institutions and market related industries. It is situated only about 4km from the University of Stellenbosch Campus.